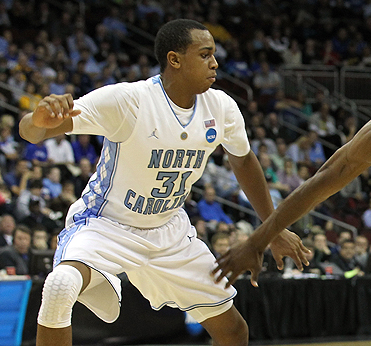 John Henson is a junior power forward who is really starting to come into his own. He has always been talented but it has taken him a few years to develop the coordination and strength to take advantage of his unique skill set and tremendous length. He is an integral part of UNC's hopes for a national championship this year and is an intriguing prospect for the next level. Has great length and uses it well to block shots and guard the rim. An intimidating defender who changes many shots and makes it difficult for opponents to score in the lane. Becoming a solid rebounder as he continues to add strength to his skinny frame. Plays above the rim and has huge wing span. Becoming a decent back to the basket player and shows a good turn around jumper and drop step move. Also developing his face up game and can knock down mid range jumpers consistently. Runs the floor very well and gets into good position on both ends of the floor. Has good vision and understanding of the game and plays within the flow of the game. Good passer out of the post and can even handle the ball a bit. Could develop consistent three point range in a few years and become a dangerous offensive player. Still very skinny and light despite working hard to add strength and weight. Will likely struggle to hold his own against the more powerful NBA centers and power forwards. A little bit injury prone.